The average employment of hired workers in California agriculture (NAICS 11) has been rising. In 2015, some 16,400 agricultural establishments hired an average 421,300 workers and paid them $12.8 billion. Average employment is a measure of full-time equivalent jobs, not unique workers. Californiaâ€™s Employment Development Department extracted all Social Security Numbers reported by California agricultural establishments and found 848,000 unique workers in 2015, suggesting two unique workers per full-time equivalent job. 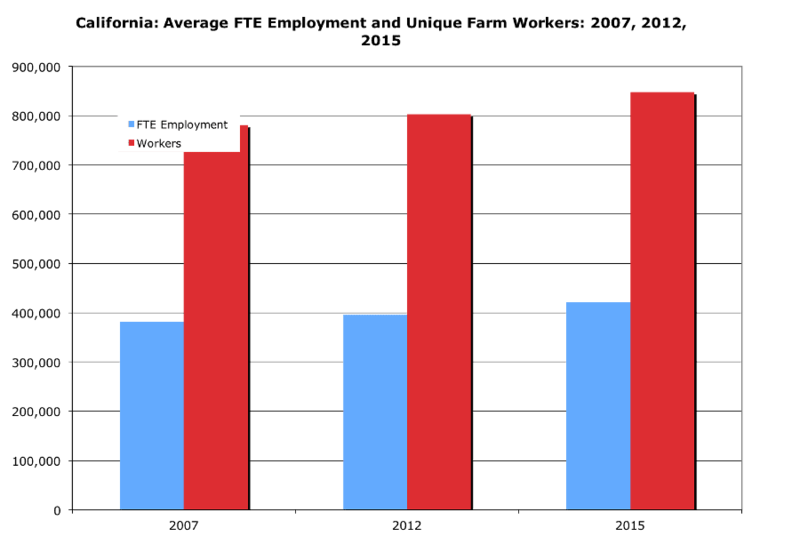 This ratio of two workers per FTE job has been stable over the past decade.